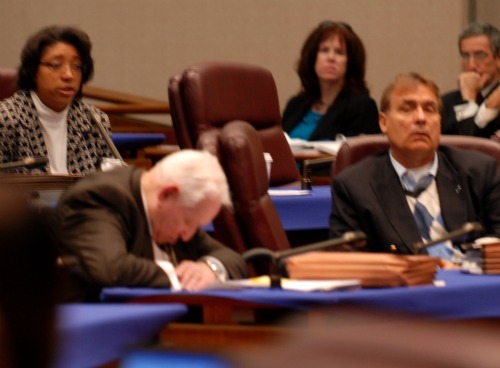 Alderman Bernie Stone is alseep at work. Another Daley do nothing Alderman. On October 29, 2010. Bernie Stone was sleeping while billions of dollars were switching hands. The 50Th ward voters were never accused of being too bright anyway. Photo by Patrick McDonough. CITY WORKERS ARE ASKED TO HELP THE CITY TO BALANCE THE BUDGET BY TAKING FURLOUGH AND SHUT DOWN DAYS OFF BY TAKING THESE DAYS OFF WE ALL ARE TAKING FOOD OFF OUR TALBES AND NOT BUYING OUR KIDS A SPECIAL GIFT AND CUTTING OUR VACATION SHORT.BERNIE STONE WAS SLEEPING ON THE JOB AND GETTING PAID AT A TUNE OFF $100.000 PLUS A YEAR AND NOT A PERSON IS DOING A THING ABOUT IT.LET A CITY WORKER GET CAUGHT SLEEPING ON THE JOB HE OR SHE IS LOOKING AT TEN DAYS OFF. Hay Pat what’s Sup!nice pic of Chicago’s great leadership.What a POC,I thing the IG should be checking him out!Well we lost our Aldermen in the 38th ward this week,now it will be an open contest! let the fun begin,maybe I’ll take a shot at it,what the hell why not? This is what I think lead by example,1. cut the City council in half.2 Enforce the 2nd amendment.3 Come with some real meaningful firearms law that will effect the bad guys,not the good guys!4. Tell the people the truth,the City is messed up because the voter’s are to damn lazy to get out and VOTE!4. Wake up Chicago. (Response) I told you to get on the ballot. You are a real hero. Get to work now. Previous PostPrevious Chicago Department of Water Management Commissioner Thomas Powers P.E.